Biography and Paintings of French History/Genre Painter. An important figure in French painting and one of the best history painters of the 19th century, Ernest Meissonier excelled in the production of small but highly detailed history painting, notably scenes from the Napoleonic War. A miserly and conceited individual, he was also one of the best genre painters, specializing in figure painting with historical costumes, often taken from the 18th century. He was also noted for his etching. From the age of 30 onwards, he received numerous awards, including the Grand Cross of the Legion of Honour - the first painter to be so honoured. Regarded today as one of the greatest miniaturist painters, the best collections of his work are in the Musee d'Orsay in Paris, and the Wallace Collection, London. Born in Lyon, the son of a grocery merchant, Meissonier first began sketching and drawing as a child. In about 1832 his parents reluctantly agreed to allow him to train as a painter, and he joined the studio of Leon Cogniet. He also devoted himself to copying works by the 17th century Dutch Realist artists in the Louvre. In 1831 Meissonier exhibited at the Paris Salon: his successful entry was a painting entitled Les Bourgeois Flamands (Dutch Burghers), but also known as The Visit to the Burgomaster. It was duly purchased by the art collector Sir Richard Wallace, in whose collection (the Wallace Collection in London) it is, together with fifteen further paintings by the same artist. The Visit to the Burgomaster was Meissonier's first miniature painting - a genre which was destined to earn him international renown. Other early exhibits included several examples of genre-painting, such as The Chess Player (1835-6, Hamburg Museum) and The Errand Boy (1835-6), which he showed at the Salon of 1836, along with The Reader, Three Smokers, The Flautist, A Poet and The Art Lovers, all in the Louvre. These early works combine excellent painterly technique - very much in the approved style of academic art - with historical realism and a highly developed sense of popular taste. Furthermore, his output was enormous and paintings such as The Parish Priest's Wine (1869, Rheims Museum) are evidence of his great skill. Following an unsuccessful attempt at religious painting, Meissonier returned to his favourite small-format genre painting, exhibiting such masterpieces as the Game of Chess (1841), the Young Man playing the Cello (1842), Painter in his Studio (1843), The Guard Room, the Game of Piquet (both 1845), and the Game of Bowls (1846). It was his mastery of microscopic detail, in the style of Dutch Realist Genre Painting, which led to his nickname as the "French Metsu", a reference to the Dutch painter Gabriel Metsu (1629-67), who excelled in miniature painting of bourgeois domestic life. Meissonier's favourite themes included scenes from 17th and 18th century life, involving games of chess, cards, playing music or tavern scenes, all executed in painstakingly exact detail. In 1855, he attained new heights when two of his pictures - The Gamblers and The Quarrel (La Rixe) - were presented by the French Emperor Napoleon III to the English Royal Court. Two years later, at the Salon of 1857, he showed nine paintings and drawings; including the Young Man of the Time of the Regency, The Musician, and A Reading at Diderot's. By now a favourite of Napoleon III, Meissonier was invited by his patron to illustrate scenes of battle from the Italian campaign (see, for instance, Napoleon III at Solferino, 1863, Louvre) undertaken by Napoleon III and Victor Emmanuel II of Piedmont and Sardinia, against the Austrian Hapsburgs. 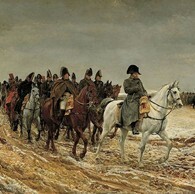 Meissonier also painted several works featuring Napoleon Bonaparte, including: Napoleon I in 1814 (1862, Walters Art Museum) and Napoleon and his staff returning from Soissons after the Battle of Laon (1864, Musee d'Orsay). Other historical works included Le General Championnet (Lyons Museum), The Barricade (1848, Louvre) and The Siege of Paris (1870, Louvre). In late 1861 Meissonier was elected a full member of the Academie des Beaux-Arts in Paris, although he was to be denied the post of Professor of Painting up on which he set his heart. He continued however to work on his oil painting with elaborate care - some of his canvases taking up to 10 years to complete - and remained a regular exhibitor. He enjoyed immense popularity during his lifetime, as is shown by the phenomenal prices paid for some of his works; he sold Napoleon in 1814 in 1890 for 850,000 francs, and his oil painting Cuirassiers for a whopping £10,000. Less well-known is his success in printmaking: see, for example, his etchings - The Last Supper, The Lute Player, The Old Smoker, the Preparations for a Duel, and The Reporting Sergeant, all in the Wallace Collection. He also explored lithography, although surviving prints are rare. History and genre paintings by Ernest Meissonier can be seen in several of the best art museums around the world.  For biographies of other 19th-century French artists, see: Famous Painters.  For more military painting, see: Homepage.